Considering the rationality of creating a website is important, but it is even more important to have a clear plan for the website designing before that. The more planning you do, the easier it is to make decisions. Not taking enough time to plan and jumping straight to website development is one of the biggest mistakes you can make when designing a new website. Answering some basic questions and refining them into a plan is an important process in understanding the web-site’s objectives and requirements. For example – What are we aiming to achieve through the website? What will the website do? Who is our target audience and how do we attract visitors? After brainstorming on the basic aims of your website, you have to understand the overall organization of the website. A website map is a desperately needed tool for planning and designing web sites. You can get a pictorial representation of your website architecture by sketching out a sitemap as it helps in creating coherent navigation paths for users to follow through the website. It shows the logical hierarchy (including primary navigation through to the secondary or sub-navigation) of the different pages within your website. Usability of your website has to be kept under constant consideration as part of your planning. Your site should not create confusion in the minds of the visitors. You should make sure the navigation between pages is clear, and it does not confuse the visitor about what to do next. With a clear website architecture map in place, you can logically understand and consider how your users will navigate through the site, then tailor content to them. 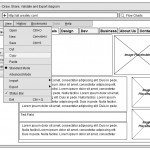 Wireframes are fundamental line drawings that allow you and your client to focus on the layout of the website. They are prototype models built for testing purposes. Wireframes show you how your website will look and feel so you can identify the functionality of the website even before engaging in development. If you are ever wondering on how to get started, you can try a sheet of paper and a pen or simply sign up for Creately and create your sitemap in the Cloud with collaboration built in. Hope you liked this post, if you got anything else to add, please write to us or leave a comment below. Wireframes and Mockups. Are they worth getting to know? Really informative. Thanks for sharing this great article. Very well drafted! I totally agree on the planning phase before starting the development of your website. It helps save a lot of your time afterwards and helps you get what you exactly want. While creating a website an user should kept in mind that the website must be user friendly and responsive. Always use standard system fonts for all HTML text, or embed a font using CSS or other technology.